Scheduled to launch next month, CONtv is a joint venture between Cinedigm, a leading independent content distributor, and Wizard World, a leading producer of live pop culture multimedia conventions. 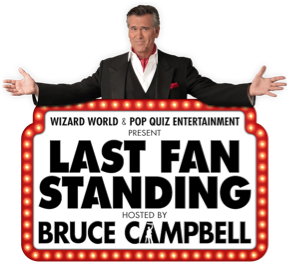 “LAST FAN STANDING” will be shot at various Wizard World events throughout 2015, and will premiere on CONtv later this year. Wonder how much Thor’s hammer weighs? Or how much damage the Vorpal blade would inflict on a 5th-Level Cleric? Fans finally find vindication in their hours studying comics, films, movies and more with host and horror icon Campbell in this outrageous new quiz show. A collaboration between his own production entity and Pop Quiz Entertainment, this will be Campbell’s first digital series. “The audience went crazy for ‘LAST FAN STANDING’ when we debuted the game at Chicago Comic Con this summer! CONtv is the perfect place to reach true fans, and we can’t wait to challenge our audiences to find out who is the ultimate pop culture guru,” said Campbell. The new series joins the recently announced “FIGHT OF THE LIVING DEAD,”a horror-competition series from Alpine Labs, BlackBoxTV and Revolver Picture Company. An unprecedented mash-up of the reality and scripted genres,“FIGHT OF THE LIVING DEAD” follows a collection of online celebrities including Joey Graceffa, Jesse and Jeana (PrankvsPrank), Justine Ezarik (iJustine), and more, as they face challenges in an attempt to survive the undead’s relentlessly grisly, and frighteningly realistic onslaught. Additionally, CONtv also recently announced an expansive portfolio of acquired film and television content available on the new digital network. Carefully selected for the passionate fans that make up the CONtv audience, the new partnerships enable the network to carry a deep catalogue of the best in pop culture obsession from pulse-pounding horror, to short-lived TV series, to cult classic films. Upon its launch in February 2015, the digital service will be offered as a free ad-supported platform as well as a low-cost monthly subscription of $6.99/month with content exclusives, audience rewards and ticketing bundle opportunities for Wizard World conventions. CONtv plans to launch across a wide spectrum of devices including Roku, Apple TV, Chromecast, Xbox, PlayStation, Android, Samsung Smart TV, Windows, Mac OS, mobile, and tablet devices. CONtv is a new digital entertainment network exclusively dedicated to the fanspace. Launching in early 2015, CONtv will offer audiences access to thousands of hours of original programming, elusive cult films and television shows, celebrated genre movies, and exclusive live coverage of Comic Con events nationwide. From quirky original series to an eclectic catalog of 1200 must-watch titles, CONtv’s seemingly endless stream of animé, fantasy, grindhouse, horror, martial arts, sci-fi, and superhero content will be available on demand through a free, ad-supported format or a low-cost, subscription-based model of $6.99 a month for premium content. CONtv is a partnership of Cinedigm Entertainment Group, the nation’s largest independent distributor of digital entertainment, and Wizard World, producers of the largest chain of Comic Con and pop culture conventions in the U.S. Together, they provide an unrivalled experiential hub of content, community, and conventions across the broad spectrum of platforms including Android, Apple TV, Chromecast, Mac OS, PlayStation, Roku, Samsung Smart TV, Windows, Xbox, mobile and tablet devices. Cinedigm (NASDAQ: CIDM) is a leading independent content distributor in the United States, with direct relationships with over 60,000 physical retail storefronts and digital platforms, including Wal-Mart, Target, iTunes, Netflix, and Amazon, as well as the national Video on Demand platform on cable television. The company’s library of over 52,000 films and TV episodes encompasses award-winning documentaries from Docurama Films®, next-gen Indies from Flatiron Film Company®, acclaimed independent films and festival picks through partnerships with the Sundance Institute and Tribeca Films and a wide range of content from brand name suppliers, including National Geographic, Discovery, Scholastic, NFL, Shout Factory, Hallmark, The Jim Henson Company and more.